Introduction. 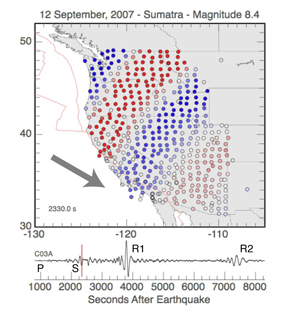 The links below take you to pages that contain some simpleanimations of the seismic waves that sweep across USArray'sTransportable Array after selected large earthquakes. The newer animations are at the top of the list and the algorithm has evolved in the last year. I think the newer animations are better than the initial efforts. At some point I will remake the older ones. One could try many other ways of doing this, but I don't havethe time for experimentation right now. I find the animationsinteresting and useful in my seismology courses and that's usuallyenough for me. The array includes stations installed as part of the EarthScope project as well as stations from the UC Berkely and Caltech seismic networks in northern and southern California respectively. Click here for more information on EarthScope. Click here for information on the status of the transportable array. Preprint of Summary Article. Thorne Lay and I have plan to submit this summary paper on these animation to Physics Today. To download a PDF version of the preprint , click here. Links to the Animations. Clicking on these links will begin a download of fairly large files (< 15 megabytes). If you have a problem viewing the animations. I've started to place some animations in the ogg format so that Linux users can view them. You can get the free, open-source ogg plugins for quicktime at http://www.xiph.org/. As I migrated from compression codec to compression codec, some of these files (the newer ones) require a plugin for QuickTime. Many of the older movies are encoded with the 3ivx D4 4.0.3 codec. So if you download a movie and try to run it in QuickTime, you may get a dialog box that directs you to a place to download and install a DivX or 3ivx plugin. Do that, it's free. For reference, I'm using ffmepgx to compress the original QT files from several hundred megabytes to less than 15 or so megabytes.